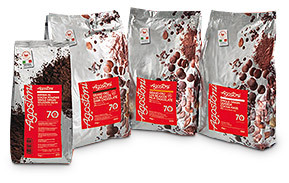 Agostoni provides chefs and culinary professionals with a premium quality line of foodservice chocolate, paste and powder with a great personality, that has been tested and approved by chocolatiers throughout Europe for over a decade. Agostoni’s unique flavor profile is carefully crafted from high quality cocoa beans, processed in-house to produce the cocoa liquor, butter and powder used in all semi-finished chocolate products, and will allow chocolate, confectioners and ice-cream makers to interpret cocoa according to their inspiration. Since the beginning, our actions have been guided by a deep ethical commitment. We build long-lasting partnerships based on respect, dialog and transparency. Agostoni’s Equal Partner Direct Buying program respects the autonomy of farmers while creating a shared commitment to sustainable agricultural practices, improved quality and yield and fair purchase prices. Agostoni celebrates the crowning excellence of cocoa, by addressing chocolate connoisseurs. The Agostoni family has been cultivating its own culture of chocolate in Icam for 3 generations, and it has lead the company to be today the Italian reference company for high quality cocoa processing. Agostoni holds a remarkable selection of premium products, as result of the careful management of an integrated supply chain, and brings together an exclusive collection of recipes that are really special and unique to offer a surprising flavour experience even to the most demanding chocolate lovers.